Two Syracuse University leaders were honored at the YWCA of Syracuse and Onondaga County’s “Spirit of American Women” Awards on Nov. 3 at the Genesee Grande Hotel. Liz Liddy, dean of the School of Information Studies, and Tatiana Williams ’16 G’17, a student in Falk College‘s M.S.W. program, were recognized for their advocacy and commitment to advance women in the STEM (science, technology, engineering and mathematics) fields, social justice and academic initiatives. The YWCA works to eliminate racism, empower women, stand up for social justice, help families and strengthen the Syracuse community. 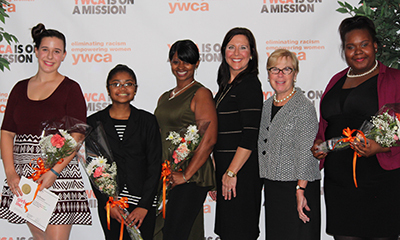 Honorees at the YWCA “Spirit of American Women” event were, from left: Ana Brickner, Mahella Soavello, Candace Williams, Kimberly Boynton, Liz Liddy and Tatiana Williams. Liddy, who received the STEM Enrichment Award, founded and led a software startup company, TextWise, and as CEO grew it to 50 employees, winning the prestigious national Tibbetts Award from U.S. Small Business Administration. She was the founding director of the iSchool’s Center for Natural Language Processing, which advanced the development of human-like language understanding software capabilities for government, commercial, and consumer applications. The holder of eight software patents, Liddy has led 70 research projects, authored more than 110 research papers and given hundreds of conference presentations on her work. Liddy was also the founding faculty advisor of Women in Information Technology (WIT), a student group that supports and mentors female IT students. Williams, who received the Volunteer of Excellence & Service Award, served as a class marshall at her 2016 Commencement, has dedicated much of her time to community service. She founded a nonprofit volunteer organization called Making a Difference for You (MAD4U) that supports teen moms, and also designed an interactive learning program on argumentation, debate and trial skills for youth in the City of Syracuse. Williams has also earned the Princeton Prize in Race Relations from Princeton University for her volunteer activity.